I have unfortunate news, that I will not be traveling to the 2018 Urban Sketchers Symposium in Porto. 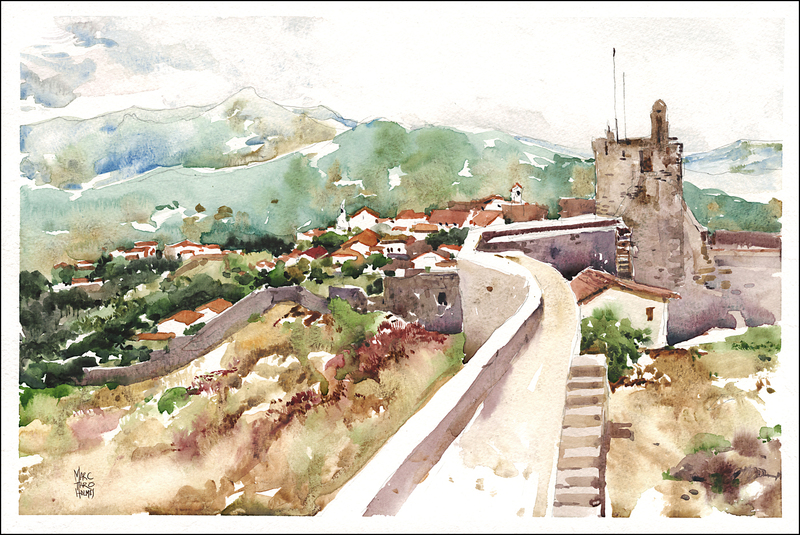 I very much regret letting down the students registered for my courses, and I will very much miss sketching Portugal with friends new and old. As regular readers will know, my stepfather has progressive dementia, and we are taking care of him at home. Though we now have part-time nursing, his condition has deteriorated to the point where I cannot be away overnight. There are falls, incidents of confusion and aggression, and many and varied late night panics that require a team of people to handle. It has become a health and safety issue that I can’t ignore. Thanks in advance for your understanding, and again, I do apologize to anyone looking forward to my demos. Still – I know you will have a fantastic time drawing in Porto. There are so many tremendous artists and wonderful subjects – you will have the drawing event of your lives! This is a detailed look at Edge Pulling. A fundamental technique for placing color on the page, and blending the edges with clean water. So enjoy, and – I’ll have a few more of these in the upcoming days! Hi Marc, you’ve shared so much of yourself and given us so many tools to help create joy in our lives. Thank you. Always take care of yourself and your family. Take care, Marc. It’s not an easy road. John and I have been where you are. We feel for you guys. My mother-in-law died of dementia and my mom is in the phase now where she needs 24×7 supervision. Hang in there. It’s not easy at all. My Aunt is a nurse in nursing home, she says humor is a big key and AARP had some articles about it recently. I’m so sad to hear this news. It won’t be the same with out you and our usual hanging out sketching. All the best for your family – I know that it is super tough at the moment with your dad. You are so generous with your talents to us, your students and followers. It it no surprise that you live your personal life with a giving spirit, too. You and your family are in my thoughts and prayers. Thank-you so much for this great video, Marc. I’ve taken your two Craftsy classes and it’s nice to hear your voice again. :) Your generous sharing on this blog and elsewhere shows what a caring person you — so it is understanding that you’d be such a caring son as well. It is both a challenge and a privilege to care for aging parents. I’m certain you find some peace and comfort in your painting. Marc- we have never met, but I feel I know you from your books and blog. I think that your openness about the issues you face are as important to some of us as your artistic talent. Words and sketching are equal windows to who we are. You are a good man, and a great artist. Thank you. And hang in there. You have a lot of supporters out here. So sorry you will miss the symposium where you will be missed as well. You needn’t apologize–many of us have been in your situation and many more will be. You will be where you are most needed. Although I did not participate, I have thoroughly enjoyed keeping up with your 30 x 30 direct painting challenge and even tried out your process several times on a recent trip. I think I’ll learn a lot by trying some more of this. Thanks for your generous teaching. Thank you for your humble sharing today. I know it is with a heavy heart that this decision was made. It is love for both your father-in-law and your wife that compels such a choice to honor him. You and your family will be included in my prayers. God bless. You do not need to apologize for taking the time to care for your family. You have given much to the urban sketchers. I am facing the same situation but not as severe, yet. Keep energized by continuing to paint and blog. We will all be here waiting for you on the other side. I am so sorry that you are going through this brutally stressful time. Wishing you strength and positive thoughts. This is truly the ultimate act of kindness. Your entire family benefits and no apology is ever needed for doing the right and kind thing. You’re also setting a perfect example for others – as always. A big and quite loud “Oh no!” flew out of my mouth when I read this. Much of that sentiment for you and all that’s happening with your step dad, and the rest of it for all of us who were looking forward to spending time and learning from you in Porto. And through all of this you just keep sharing. . .your wonderful videos and illuminating painting processes. Take care through this difficult time. And love to Laurel. Family comes first, sorry to hear of your troubles…losing loved ones to dementia is very hard. So sorry to hear this, Marc. I know what a disappointment this is for you. Stay strong with this challenge that you’re facing. I know your students will miss you but because you are so well loved, all will be forgiven. I will add you and your whole family to my prayer list as you help each other out, Marc. This must be so disappointing for you, and the others who will miss you. You’re doing the right thing, although it’s a difficult journey, I know. I’m sorry you’ll miss the symposium, Marc. Thank you so much, Marc, for your candid and heartfelt message. I hope you always remember that everyone who follows you, students and readers alike, is with you in spirit as you take care of your stepfather in such challenging times. Anything you share is a delight. My father passed years ago from Alzheimer’s. Heartbreaking. There has been a series on the internet called Awakening from Alzheimers. One of the recommendations I remember best is to give doses of supplemental Coconut Oil, and use it in cooking. In general, healthy eating as well, greatly limit sugar. Very sorry to hear Marc. Thoughts are with you and your family. Thoughts and prayers to you and your family. I’m not scheduled to attend, but I follow your blog and have learned a tremendous amount from your writing and books. I know this is a difficult time and I admire your diligence through this difficult journey. Sending energy, stamina and supportive thoughts across cyberspace. I’m a real fan! Family is first and you will never regret the time you are spending now taking care of your step-father. Don’t neglect yourself, by the way. Blessings on you and your family and for making a tremendous sacrifice. undertand You are doing important work at home. Take care of what you need to, there will be other seminars and symposiums. Sending love and empathy to you and your family…..we cared for my mother with similar needs! Family first! Dear Marc. I was not going to Porto, as I live in Sydney, but I do feel for you and your predicament. I am sure people who are familiar wirh dementia will understand and as it niw affects so many of us, you will have liads of support. It is an ugly disease and so terribly distressing for family. I wish you well in this trying time and rest assured that we will all still be following you when you have the time. With very warm wishes from someone you dont know, but who admires your talent and reads your book every day. Diana Brandt Sydney. Thoughts and best wishes Marc at such a tough time for you all. Sorry to hear that Marc. I wish you and your family well though these difficult and trying times. Sorry to hear the sad news. it is difficult but be assured you are doing what is right by caring for your family. My husband is terminally ill and I am caring for him at home. I have had relatives in nursing facilities and it is not a good option. All marketing and no substance. The one consolation is that I can paint and draw at home in my studio. Thank you for your wonderful videos – my thoughts are with you. Tania Lebedeff U SK mtl. Hi Marc, so sorry to hear you and your family are having such a rough time. Having been through this ourselves, all I can say is support and love each other, get through a day at a time. Our blessings and thoughts are with you and your family, . So sorry to hear your news Marc. I know you will be missed in Porto but it is very special that you are giving your step-father this time. There will be more Porto’s more symposiums. Take care of yourself and Laurel. Sorry to hear this Marc. It is as difficult to your dad as it is to the caregiver, even more to the last one, it drains a lot of energy out of you. Mom had dementia also. We three siblings had to take turns at nights because of the constant wake ups. Make sure you sleep well. Take care of yourself, best wishes for you and your family. Sorry to hear your own situation Adriana. Yes, my mother is committed to doing most of the night shifts, (we’re just a shout away upstairs). But I hope she’ll be ok with some help with that soon? Maybe a night nurse? will see. Marc…you are not alone on this journey. My family is dealing with a 95 year old who demonstrates these same symptoms. We do the very best we can in these times and find deeper meaning in life and relish the joy of “escaping” into our art. Sending strength and patience to you and yours. Thank you for ALL your sharing and exceptional talent. Knowing already the medical issue about your father I wish you wisdom, strength and courage. I too am in this situation, not anywhere near as severe, and applaud you for taking on the roll of caregiver. Even at this stage I would so appreciate help, but our families live too far away. Prayers to you and your family, and thank you for your generosity to the art community as well. We were counting on you Marc…it’s a pitty that you will miss Porto USK Symposium and that we will miss your great tutorials. I have had the chance to meet you at Sagres (2016) on my first USKP experience … and one of the greatest so far! I fully understand the hard times your family is having to deal with, and the importance of being a supporter during these times. Hope for the best! Thank you for a wonderful tutorial! Really simple explnation, easy to follow, and with a beautiful painting as the end result. Super. So sorry to hear that. I was looking forward meeting you. We will miss you. Thanks for the sharing of instructional videos , have been looking forward to it for a long time. Take care of yourself and your family, look forward to attend your live lessons one day.